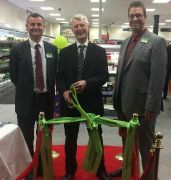 Radstock Co-op proudly opened its doors on Wednesday 2nd December to the newest addition to their retail estate at the site of the former Fromefield doctor’s surgery at the junction of Bath Road and Rodden Road. The store’s architecture has some contemporary design features and has a prominence that no one could fail to miss from directional approach roads. The store’s construction is of the highest energy efficient and environmentally friendly standards with an air management system which redistributes and circulates hot and cold air where needed to maintain a thermostatically controlled temperature. There was a VIP launch event on the evening of 1st December 2015 which was attended by local dignitaries, including the Mayor of Frome, strategic business partners , supporters of the Society, other local traders and representatives from community services such as local school, Frome College and the new doctors’ practice. The store was officially declared ready for business by Robert Slade, Practice Manager of the Medical Centre, due to his strong links with the Society, having served for a number of years as chief executive and until recently, worked from the building which was demolished to allow for the development of the Fromefield Co-op, and who subsequently re-located to the new medical centre across the road. The cutting of the ribbon ceremony was observed by invited guests, directors and colleagues of the Society. Chief Executive, Don Morris and Tim Schuster, store manager presented a cheque for £250 to Robert Slade payable to the Patient Participation Group of Beckington Practice which will go towards equipment not funded by the NHS as determined by the Group. Once the formalities were completed, guests were invited to look around the store to see the impressive offering. The store’s interior is very bright and spacious with wide aisles providing a clear vision to ease navigation. There is an impressive chilled and frozen section providing a good selection of fresh produce, chilled and frozen meal options, ready meals including pizzas, fresh and frozen meat and poultry as well as the usual grocery selection. This is complemented by a bakery providing all your breakfast products, freshly baked breads, pastries and even a Costa Express. The co-op also supports local suppliers and producers such as Lilley’s and Thatcher’s Ciders, Bath and Butcombe Ales and Lye Cross cheese etc. The co-op opened for trading the following day at 9 am and received a steady flow of customers eager to see for themselves what all the fuss was about. One lucky customer, who was the first to the check out, was presented with a food hamper.